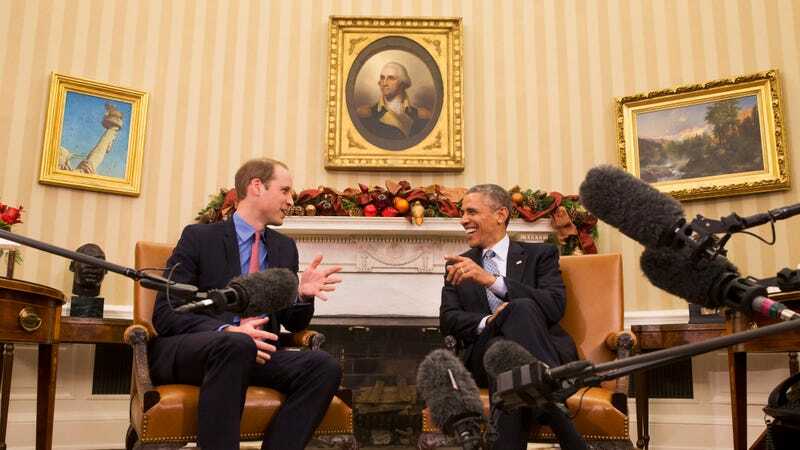 President Obama had a meeting with Prince William in the Oval Office today. Sitting under the a portrait George Washington, the two men chuckled and acted like old pals. They did not, however, take any selfies. And neither did any of the reporters present because they were explicitly asked not to take selfies in the Oval Office. The question of taking selfies with the president present was stirred up again in April, when David Ortiz (sponsored by Samsung) took a selfie with President Obama and posted it to Twitter (sponsored by Samsung). Ortiz had a deal with Samsung and got paid for the tweet, prompting the White House to consider banning selfies. Now it appears that Obama's handlers just took one step towards that all-out selfie ban in the Oval Office.